More than 9,000 banking organisations, securities institutions and corporate customers in 209 countries trust SWIFT (Society for Worldwide Interbank Financial Telecommunication) every day to exchange millions of standardised financial messages. Commensurate with its role in the global financial system, SWIFT has implemented a business continuity strategy that addresses the expectations of its customers in the financial industry in the areas of availability, reliability and resilience. 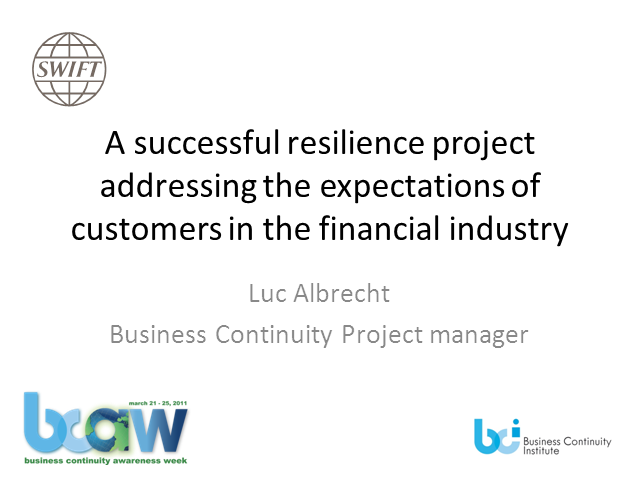 This Webinar describes how SWIFT has successfully implemented the resiliency process which represents a strategic investment toward protecting and growing the company franchise.